I think all postal historians are fascinated to some extent by covers showing enormous postal rates during periods of gross inflation. A number of historical examples are available - Austria 1922-25, Hungary 1946, South American countries off and on this entire century. One of the most famous of all, however, is Germany of 1923. During the post-WWI years, the value of the German mark steadily deteriorated, largely as a result of reparations payments and the savage penalties imposed on German trade. Faced with budgetary deficits, governments followed a practice of issuing more money to meet expenses. The result was a runaway inflation more severe than that experienced in any other part of Europe. During 1922, the value of the Mark in US dollars fell from 162 marks to more than 7,000 marks (the pre-1914 relationship had been 4.2 marks to the dollar). On April 27, 1921 the Allied Reparation Commission fixed the total War Reparations to be paid by Germany at 132,000,000,000 gold marks. Regarding the sum as far in excess of what the country could pay, the current government resigned. In the face of an Allied ultimatum based on a threat of an occupation of the Ruhr, the new chancellor secured a reluctant vote in favor of paying. It proved impossible to pay the required sums on time, and the French made a technical default by Germany in timber deliveries the pretext for occupying the Ruhr in January 1923. The occupation vastly worsened the economic situation. The German government (another new one) ordered passive resistance to the French and Belgian attempts to get the mines and factories working and a ban on all reparation deliveries. The occupation forces replied with mass arrests and an economic blockade that cut off the Ruhr and the greater part of the Rhineland from the rest of Germany. This was a devastating blow to the German economy, especially after the final loss, in 1921, as a result of a plebiscite and League of Nations ruling, of the coal mining and industrial areas of Upper Silesia. As a result, by July 1, 1923 the mark had fallen to 160,000 to the dollar; by November 20, 1923 it was down to 4,200,000,000,000 (4.2 trillion) to the dollar. Barter replaced other commercial dealings and food riots broke out. We have probably all heard the story about the workers being paid every few hours, and of the workman who took a wheelbarrow full of paper money to the store to buy bread. He parked it outside (after all, who would bother stealing it?) while he went in to see if any bread was available. When he came out, he found the money dumped on the ground, and the wheelbarrow stolen! See the confusion over the billion? 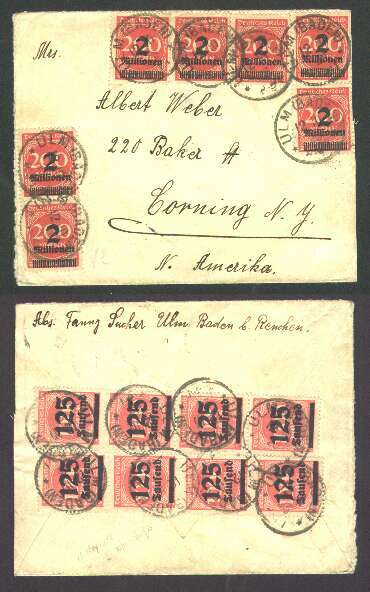 Posted to U.S.A. on Oct 12, 1923 with a total of 15 Million marks paying international letter rate set as of Oct 10. Seven copies of the 2 Million Marks surcharge on 200 Marks rose, and two strips of 4 of the 125 Thousand Marks on 1000 Marks salmon. 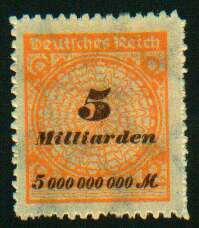 Posted on Nov 10, 1923 with a total of 1,000,000,000 Marks (1 Milliard Marks) paying the inter-city letter rate (Fernverkehr) for up to 20 grams set as of Nov 5. 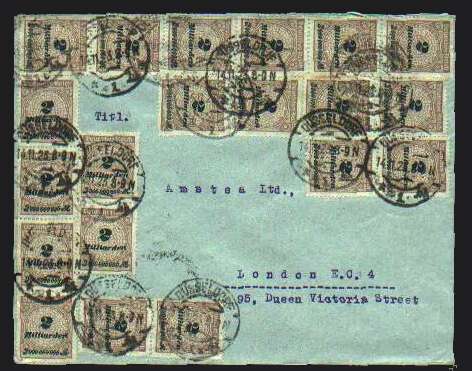 Posted to London England on Nov 14, 1923 with a total of 40 Milliarden (40,000,000,000) Marks, paying the international letter rate for up to 20 grams set as of Nov 12. 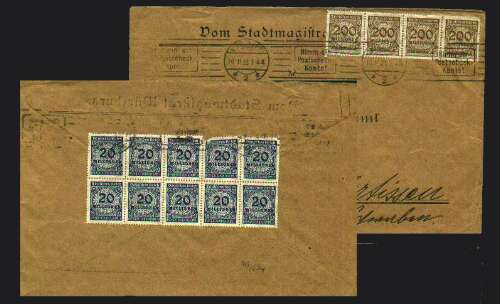 Franked with 20 x 2 Milliarden Marks stamps.